The elevator at Fredericksburg Branch is currently out of order. More info. The Phantom of the Opera is considered to be one of the oldest classic movie monsters - and one of the creepiest. Born in a French novel, put into two silent films and a popular Broadway musical, the Phantom has made an impact on the horror world. French author Gaston Leroux wrote Le Fantôme de l’Opéra. He studied to become a lawyer at first but had more interest in theatrical arts. When Leroux inherited his father's fortune, he immediately squandered it through gambling, which put a dent in his legal education. However, Leroux landed a job on the daily newspaper, L’Echo de Paris, in 1890 and was thrilled when asked to combine his knowledge of law and love of the theater as a court reporter and drama critic. After traveling around the world for quite some time, Leroux returned to Paris to settle down and become a novelist. In 1907, he used his admiration for authors Edgar Allan Poe and Sir Arthur Conan Doyle develop the character of a young detective, who solves an impossible crime committed in a locked room. The book was called The Mystery of the Yellow Room. In 1911, he published Le Fantôme de l’Opéra. An omniscient narrator tells the story of a disfigured man who lives under the Paris Opera House, or Palais Garnier, at the turn of the century. Erik Claudin, the phantom musician, is obsessed with aspiring opera singer Christine Daaé. He is drawn to the beauty in her voice and convinces her that he is her "Angel of Music," whom her deceased father had spoken of. Christine becomes torn between her dedication to her "Angel of Music" and her childhood crush, Viscount Raoul de Chagny. When she denies the Phantom and his love for her, he seeks terrifying and murderous revenge. The strongest element is the narrator's voice (thought to be Leroux's own voice) unveiling a quest to find evidence of a French opera house ghost. The narrative delves into research with the reader in tow, introducing printed police interviews and eyewitness accounts from the players and the public alike.The novel was popular among readers and some critics. Public interest was generated through seemed to be through the serialization of the story in French, English, and American newspapers. A researcher for Universal Pictures read the serial, which set in motion the 1925 silent film, starring Lon Chaney, Sr. The Phantom was produced twice for the silent film industry. In 1916, Das Gespenst im Opernhaus, a German silent film was released and is considered to be the first on-screen production. However, the film is considered to be lost. There are no copies of the film, no on-set photographs, or even a poster related to Das Gespenst im Opernhaus. All that is known is that it was filmed in autumn of 1915 in Germany and directed by Ernst Matray. In 1925, another film was made by Universal Pictures with pre-Method actor Lon Chaney, Sr. (or "The Man of a Thousand Faces.") The black-and-white, silent film was initially directed by Rupert Julian. Universal Pictures experienced multiple production problems during the filming, including strained relationships among the director, film crew, and actors. When Julian was told to remake the film in January of 1925, he walked out. Director Edward Sedgwick was then assigned by producers to reshoot and redirect the bulk of the film. The Phantom of the Opera was converted to a twisted romantic comedy, which was heavily booed off the screen in April 1925. Finally, the third and final version of the film was given to Universal editors Maurice Pivar and Louis Weber, who edited the entire production down to nine reels. Most of Sedgwick's material was taken out, and much of the original content from Julian was returned to the picture. The final product was released in October 1925, receiving positive reviews from critics and audience members and making a respectable $2 million. 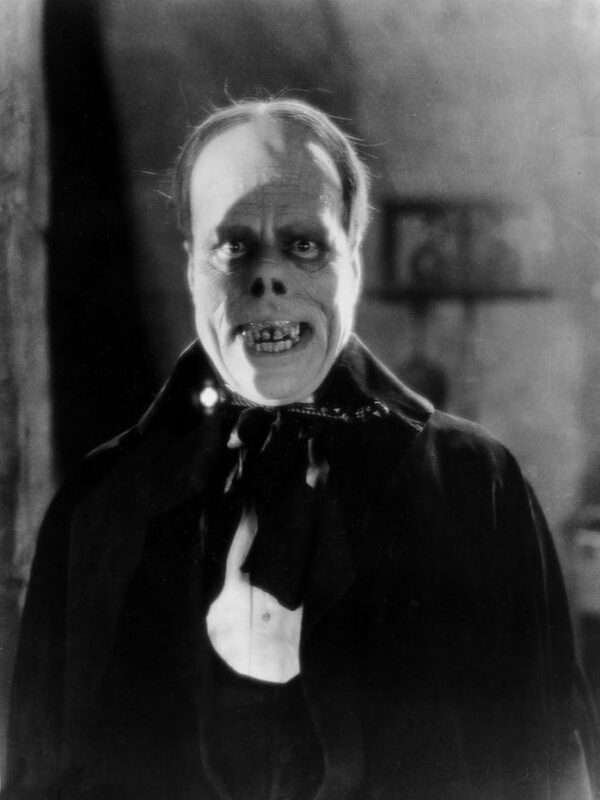 Lon Chaney, Sr., who had successfully applied his own makeup in 1923's The Hunchback of Notre Dame, was given the freedom to create his own makeup for The Phantom. Chaney painted his eye sockets black, giving a skull-like impression, and pulled up the tip of his nose, pinning it in place with wire and enlarging his nostrils with the black paint. Chaney, Sr. included a set of jagged false teeth to complete the ghastly look. According to audiences who first saw The Phantom of the Opera, many screamed or fainted at the scene where Christine pulls the concealing mask away, revealing The Phantom's face. Chaney, Sr.'s appearance has been the most accurate, in accordance with the book. In other adaptations, he is disfigured by acid or fire. Popular composer Andrew Lloyd Webber created a musical based on Leroux's novel, with lyrics by Charles Hart and Richard Stilgoe. The musical features songs, such as "Think of Me;" "Angel of Music;" the title song, "The Phantom of the Opera;" and "Music of the Night." It opened in London's West End in 1986 and on Broadway in 1988 and received critical acclaim and multiple awards, including the Tony Award for Best Musical of 1988. The original Phantom, Michael Crawford, received the Laurence Olivier and Tony awards for his performance. Sarah Brightman also received praise for her role as Christine. It is the longest-running show on Broadway and celebrated its 10,000th performance in February 2012. In December 2004, a film version, directed by Joel Schumacher, was released, starring Gerard Butler as the Phantom, Emmy Rossum as Christine, and Patrick Wilson as Raoul. Rossum and Wilson both had singing experience, but Butler had none and took music lessons. The Phantom of the Opera grossed $154 million worldwide, despite receiving mixed to negative reviews. Leroux did not live to see the success his novel created due to his death in April 1927. It is believed that he did see the Universal Film in Paris during its release in November 1926. Although Leroux only lived until he was 59 and wrote over 60 novels in his lifetime. However, Le Fantôme de l’Opéra and The Mystery of the Yellow Room are the only two you can find in print. The novel, through its popular dramatizations, has long outlived its author and become a worldwide sensation. Surely the Phantom himself would be happy with that.